Mayank has more than three years of experience in the IT services industry with a proven record of accomplishment of delivering quality work products. He is a serial entrepreneur with names like info360degree, and five-finger solutions already under his name. Richard has a B.Tech degree in applied petroleum engineering and an extensive expertise in Java, Asset, Supply chain management as well as Workflow management. 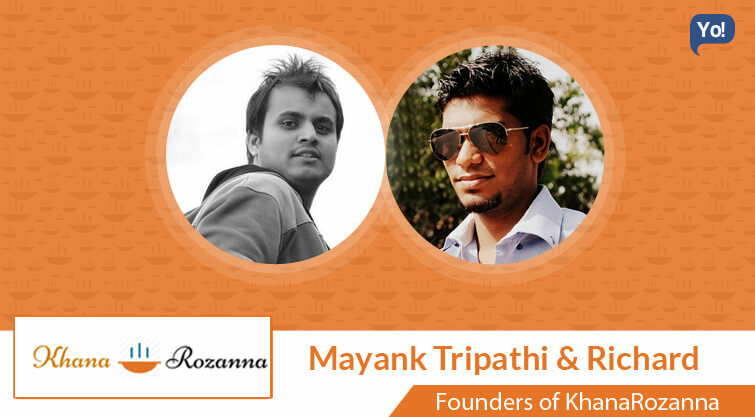 Both of them took cognizance of the popularity of food tech startups and pondered upon the idea of starting their own homemade meals delivery service. Within a span of three months, they have built a huge buzz around them delivering over 1000+ meals. They believe that repeat customer is essential than customer acquisition. This is what makes the business sustain its growth over a long period. KhanaRozanna is about providing homemade lunch and dinner to working professionals and individuals at an affordable cost. KhanaRozanna operates with the motive of inculcating the habit of eating healthy food among individuals who try to meet their hunger by eating at restaurants regularly, which is not healthy in the long term. We own the entire cycle from sourcing raw materials to packaging and the delivery is outsourced to our logistics partners. All our cooks and staffs are hired and trained under KhanaRozanna and are directed to cook food in a homemade style, which is healthy and tasty as the same time. Being in IT company for three years and consuming cafeteria food for lunch though we use to regret every day finally forced us to create something which we can be proud of. We want people to eat healthy and tasty at the same time and that also without the tension of spending a chunk of money. We realized that after an age of 35 (on average) IT employees starts suffering from obesity, diabetic complaints, pressure related diseases and slowly and steadily the life becomes a restricted zone. All this suffering is because of eating habits and quality of food. We want people to get rid of this and opt for healthy food and enjoy freedom even when people say “they are no younger enough”. The most challenging part for us is to make people believe that we are different than other food startups. People use to assume us like any other food startup giving restaurant style food or cuisine based food in the name of homemade food. First 10 days were 0 orders for us and then slowly when people started to order, they liked our food and showed trust on us. Quality is what we swear by and keeping our quality intact made our customers trust us and this increased our repeat orders and word of mouth referrals as well. No matter we got less order or may be 0 order initially, we never compromised on the quality of food we use to prepare for any cost cutting. We knew that people will pay if we offer them good quality and healthy food. In addition, this exactly happened, even when we raised our price by a small margin we did not lose a single customer. We are a bootstrapped company so far, all the investments are pulled in from the founder’s saving. We are looking to raise funds and are in talk with few angels and HNI’s for the same. Our entire team along with our customers are bonded by heart, there is no place of the brain in food. As a company, we are a small team and very tightly knit. Like mentioned above, we are a bootstrapped company and spending every buck by thinking twice is what we follow. We have used free resources wherever available, this includes the design of the site (WordPress and woo commerce). Raising Invoices (free invoice generator), Maintaining Balance sheet (excel) putting stickers on packaging (handwritten notes). I sleep very less, waking up early gives me an edge to finish most of my work when others have just started their day.I believe in power naps and this keeps me pushing till late at night. My Discipline for the gym. I was a disciplined guy when you talk about pumping irons but lately, I am delaying my gym schedule by giving myself some or other reason. I hate visiting doctors and I know my workouts and my food habits will only save me from getting face to face with a doctor on the other side. Have patience and keep moving. But at the same time, you should know when to stop. Believing themselves and taking the risk. When we are young and not tied to most of the responsibilities, we can afford calculated risk. Experience matters a lot in life, be it personal or professional. Everything we do, every person we meet, every word we speak comes back to us as an experience eventually in life. You actually startup 2 years after you thought you started your startup. This is a very popular line but I have personally experienced this after multiple failures and losing personal assets but learning from mistakes. We would like to expand to all the metros and top tier 2 cities. I would be less emotional and more business oriented in running my startup.This is all that I learnt from my failures. There is a place called Karuna Farm in Kodaikanal, every time I go there I come as a new human being. Visiting there is like a rebirth for me. Apart from that, I am looking forward to my visit to Cambodia (planned and delayed for some time now) and Chadar trek.